CD (ST) Boulevard. 467666 2. 1990. Produced by John French and David Herzog. Engineered by John French. Assistant Engineer: Mark McDougall. All songs programmed & arranged by David Herzog except ‘I Only Have Eyes For You’ Version #2 Arranged by Peter Jones. ‘Night’ music & ‘Jim Shilling’s Theme’ Arranged by John Capek. ‘Night’ music & ‘Jim Shilling’s Theme’ Produced by John Capek & Davod Holman. 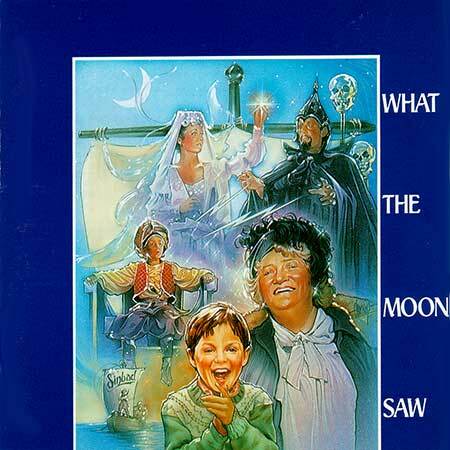 ‘What The Moon Saw’ includes excerpts from the original stage musical ‘Sinbad - The Last Adventure’ by Frank Howson & Ian McKean, which premiered at the Playbox Theatre, Melbourne, January 1982. Bass: Roger McLaughlan. Guitar: David Herzog. Drums: Mike Jordan. Piano: Peter Jones. Acoustic Bass: Nick Heywood. Strings: Peter Jones. Military Snare: Peter Blick. Backing Vocals: Mal Stainton, Lisa Edwards, Greg Hine, Rose Bygrave, Marcie Howard, Tilarni, Peter Cupples, Steve Wade, Darion, Christine Sullivan, Mark McDougall, David Herzog & Adrian Button. Additional Programming & synthesisers: John Capek. Additional advice & cheesecake: Ian McKean. Executive Producers: Frank Howson and Peter Boyle. (Harry Warren/Al Dubin). (J. Albert & Son Pty. Ltd). The Sunset Dance Club. (Frank Howson/Ian McKean). (Boulevard). The Sunset Dance Club. (Frank Howson/Ian McKean). (Boulevard). v: Danielle Spencer. (Frank Howson/Ian McKean). v: Ronnie Charles. (Frank Howson/John Capek). (Boulevard/Balmain). v: Nicki Paull. (Frank Howson/John Capek). (Boulevard/Balmain). v: Venetta Fields. (Charles Collins/Fred W. Leigh). (Public). v: Pat Evison. What The Moon Saw (Jim Shilling’s Nightmare). (Frank Howson/Ian McKean). (Boulevard). v: The Bagdad Cats. (Frank Howson/Ian McKean). (Boulevard). v: Mal Stainton & Tilarni. (Frank Howson/Ian McKean). (Boulevard). v: Kim Gyngell. (Frank Howson/John Capek). (Boulevard/Balmain). v: Mark Hennessy & John Capek. (Harry Warren/Al Dubin). (J. Albert & Son Pty. Ltd). v: Danielle Spencer. Something Is Wrong Tonight (Extended Mix). (Frank Howson/Ian McKean). (Boulevard). v: Ronnie Charles. Where The Rainbow Ends (Extended Mix).